The Maritime Aquarium inspires people of all ages to appreciate the Long Island Sound marine ecosystem through living exhibits, marine science and environmental education. Create a dynamic, high-profile exhibit that captivates, engages, and educates patrons. 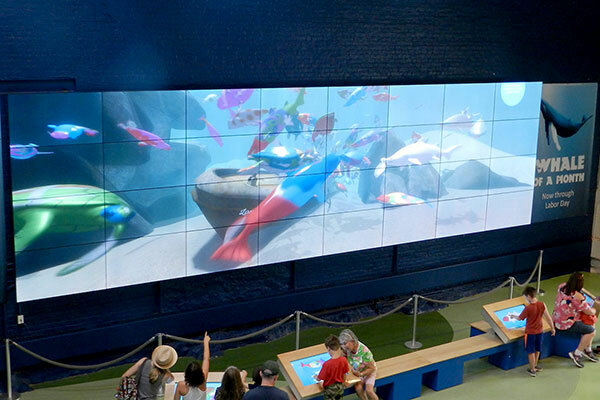 RGB Spectrum’s MediaWall™ V processor drives the Aquarium’s immense 32-panel 4x8 4K UHD resolution video wall. The virtual reality application required the highest-level, real-time video wall processing capabilities. The versatile MediaWall processor treats the entire wall as a single, seamless display canvas. Visuals can span the entire wall and be displayed in windows of any size, anywhere with stunning 4K clarity.